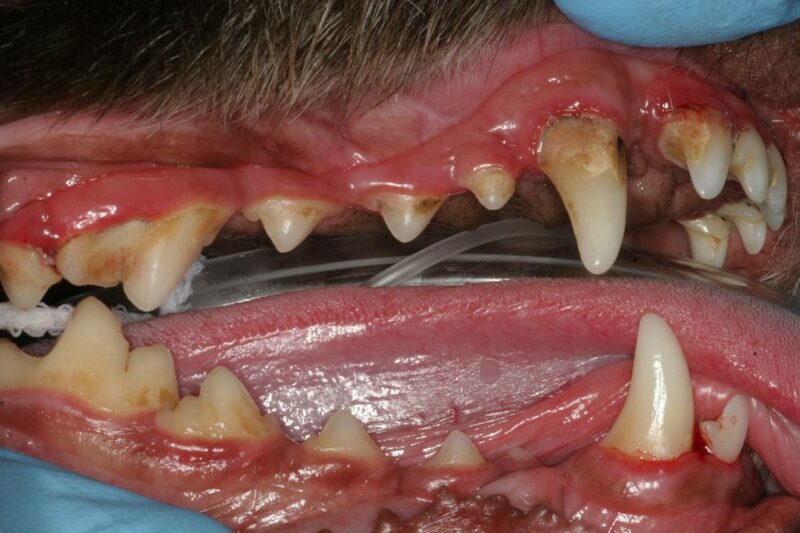 Periodontal disease is one of the most common diseases diagnosed in dogs and cats. Simply put, it is a disease caused by the build-up of plaque along the gumline. Plaque is a sticky material that builds up on teeth and contains millions of bacteria that are protected within the plaque biofilm. Plaque causes the first stage of periodontal disease- gingivitis- indicated by swollen and bleeding gums. As periodontal disease advances, it affects the structures that surround the tooth and hold it in place, including the cementum that covers the root of the tooth, the periodontal ligament, and the alveolar bone. This leads to eventual tooth loss as these structures are destroyed. Dental plaque is made up of a biofilm of bacteria that adheres tightly to the teeth. This plaque accounts for the “fuzzy” feeling of teeth after they haven’t been brushed for a period of time (think of how your teeth feel when you wake up in the morning!). The bacteria in the plaque cause an inflammatory response in the gingiva (gingivitis), which can progress and affect other structures of the teeth as it infiltrates below the gumline. It is important to understand that removing the plaque from the visible surface of the tooth is only one part of treating periodontal disease. If the disease has progressed beyond gingivitis, removing plaque build-up under the gumline is critical. This is one of the reasons why scaling teeth without anesthesia in our animal patients has no benefit at all, and often causes unnecessary pain and suffering. Plaque, if left undisturbed on the tooth surface, will eventually calcify and harden into calculus (also known as tartar). These hard deposits will also form under the gumline as periodontal disease progresses. Once plaque has hardened into calculus/tartar, it can only be removed by scaling with sharp scalers or ultrasonic instruments. There are no mouthwashes, rinses, or strips that will effectively remove calculus once it has hardened on the tooth surface. This is a picture of a dog under anesthesia for an oral examination and x-rays. Note the layer of plaque and calculus along the gumline causing red and inflamed gums (gingivitis). This is the first stage of periodontal disease. 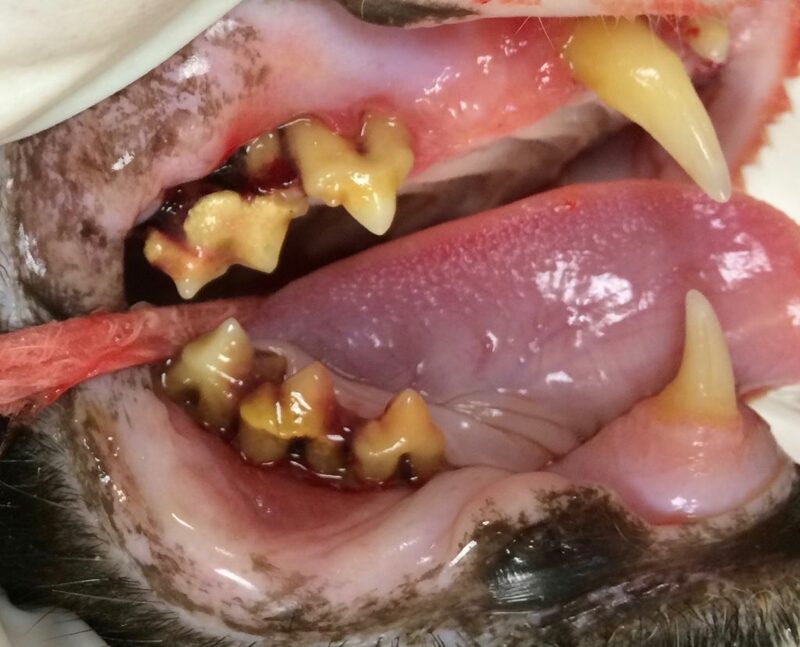 Are there risk factors for periodontal disease in dogs and cats? Yes, there are certain factors that can increase the risk of periodontal disease in dogs and cats, although any age or breed of animal can be affected. Genetics- Just like in people, some animals are more prone to developing periodontal disease than others. Smaller breeds and purebred dogs and cats are particularly susceptible. • Crowded teeth- This is seen in the smaller and brachycephalic (short-faced) animals. In many toy breeds and brachycephalic breeds, the teeth are too close together or can be rotated in an abnormal position, making them more prone to developing pockets of bacteria around the teeth. • Diet- Diet does not play a specific role in the development of periodontal disease. Although chewing is a good way to mechanically remove plaque from the teeth, there is no magic chew toy or diet that will prevent periodontal disease on its own. Chew toys, diets, and bones should be considered a component of proper dental care, not a sole strategy for prevention. 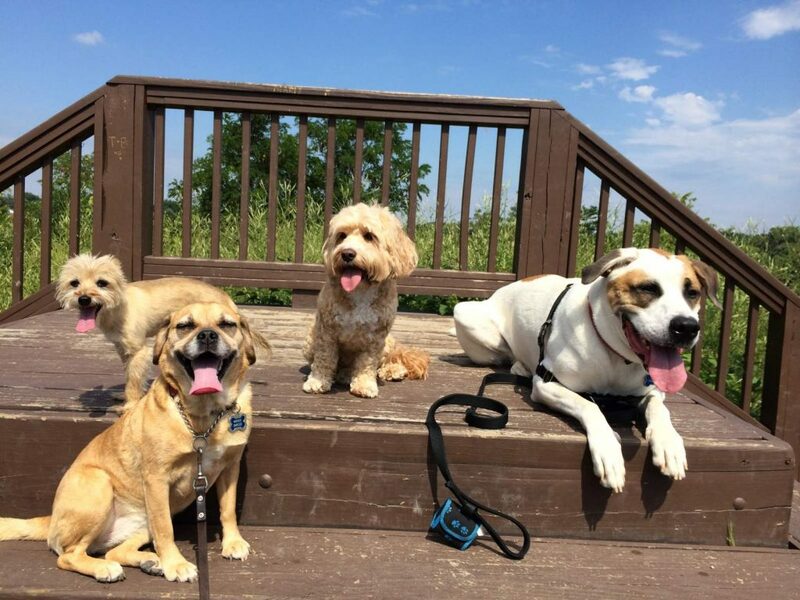 Periodontal disease can affect all sizes and breeds of dogs and cats, but smaller dogs, like the little terrier on the left, are predisposed to more severe forms of the disease. Does periodontal disease affect the body? Yes! It is becoming more and more apparent through research that chronic disease/inflammation in the mouth can affect other organs, including the liver, lungs, heart, kidneys, etc… It is also well-known that periodontal disease can make conditions like diabetes much harder to manage. That’s why a healthy mouth=healthy body! 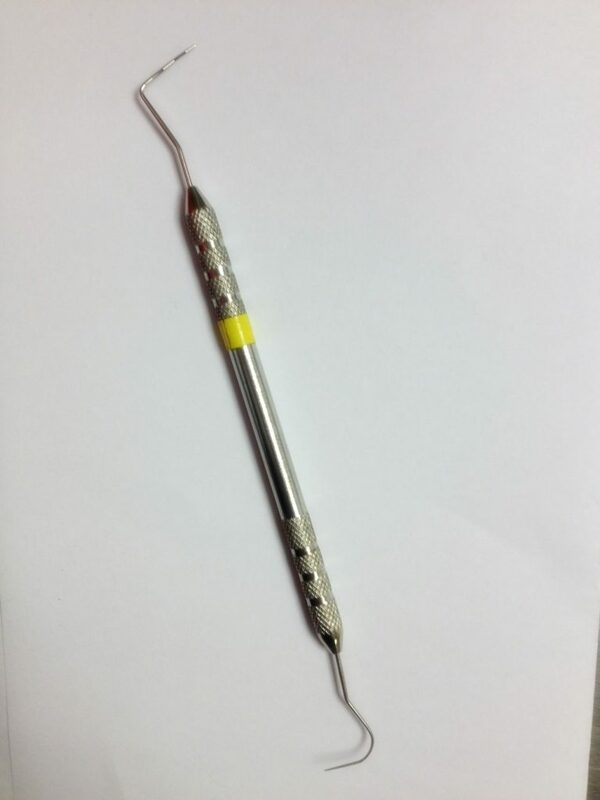 This is a picture of a periodontal probe and explorer. This is used to identify pockets in the gums around the teeth and areas of disease, such as resorption, fractured teeth, or caries. Probing all areas around all teeth, including the ones far back in the mouth, is an important part of a complete oral examination, and one that cannot be accomplished appropriately without anesthesia. There are some advanced techniques available to veterinary dentists that are specifically for the treatment of advanced periodontal disease. These are utilized for those owners that are highly motivated to prevent tooth loss. Options include bone grafting techniques, membrane placement, flap techniques, and root planing. Whether or not a tooth or teeth are amenable to these types of treatments depends largely on the type of bone loss affecting them and the ability of the owner to provide proper home-care (brushing) and comply with scheduled rechecks (often involving anesthesia). The good news is that periodontal disease can be prevented in most animals. Unfortunately there are some cats and dogs that have such a strong genetic predisposition to periodontal disease that even with daily brushing and regular dental care, tooth loss will still occur. Fortunately our dogs and cats can live very happy lives without teeth. Brushing is the single most effective thing one can do to remove plaque build-up from around the teeth. Daily brushing should be your goal. However, some pets require more frequent brushing than others. Wipes made for dogs and cats are another good option for the prevention of plaque build-up as they provide much of the benefit of mechanical removal of plaque that brushing does. 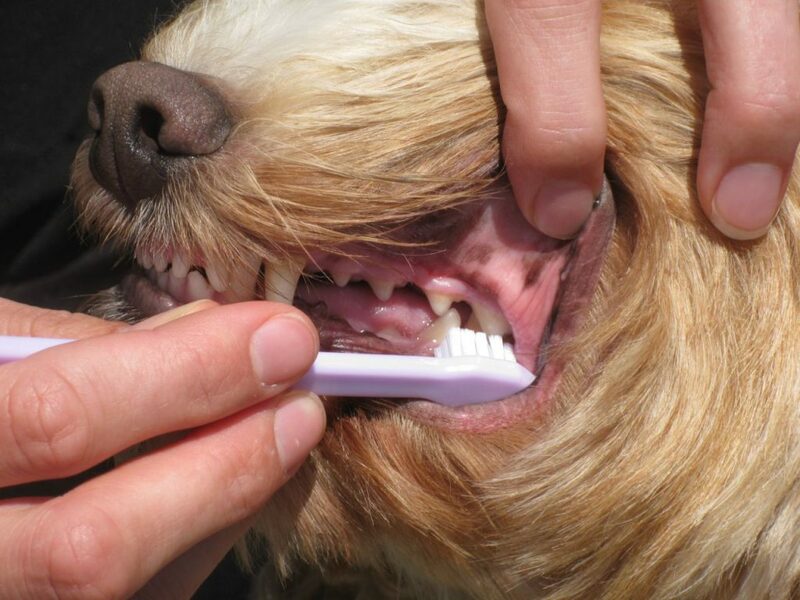 For dogs and cats that won’t allow a toothbrush in the mouth, wipes are the next best option. I’ve had success just using a gauze square and wiping the teeth with that as well. Chew toys and other oral devices can be considered a supplement to brushing, but it is important to understand that they should not replace proper brushing. Note: we see a large number of dogs that have fractured teeth while chewing on really hard chew bones, particularly nylon bones, marrow bones, antler bones, pressed rawhide, etc… Use these chews with caution and check your dog’s teeth regularly. Chews that are soft or rubber, or flat rawhides and other dental chews, are generally very safe for the teeth. 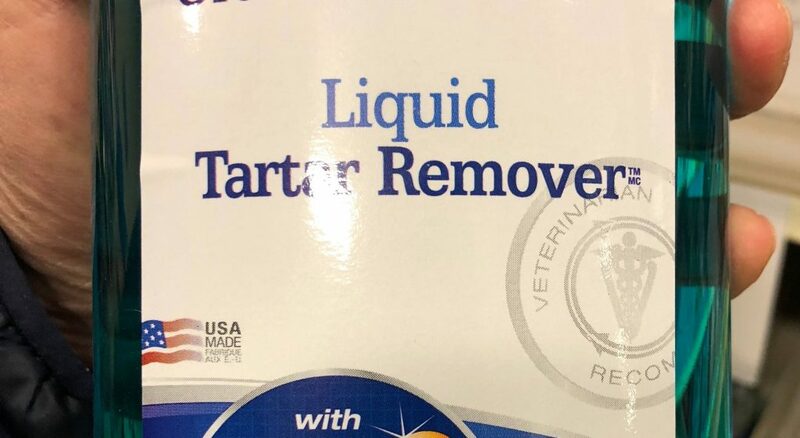 As a general rule, if a product that you find at the pet store or online advertises by saying that it will remove tartar with no brushing required, it is likely not a very useful product. As discussed before, plaque is well-protected in a biofilm and requires mechanical disruption to remove. Additionally, once it hardens into calculus/tartar, it is almost impossible to remove without sharp instruments. Lastly, professional care, just like in people, is a huge component in proper dental care. See your veterinarian or a veterinary dentist regularly to see if a professional cleaning is warranted. Most dogs and cats (especially small breed dogs) will require professional cleanings many times throughout their lives (these might need to occur every 6-12 months depending on the particular dog/cat). How often, and at what age they need their first cleaning, should be determined by your veterinarian or veterinary dentist. Lastly, make sure that dental radiographs are a component of your pet’s dental care. Remember that animals DO NOT show signs of dental pain and are often suffering silently from pain or infection in the mouth. It is up to us, as their guardians, to make sure that they are free from any suffering. Brushing is the gold standard when it comes to preventing periodontal disease! If a product promises to remove tartar without brushing, it is a marketing gimmick. Tartar (the hard build-up on teeth) can only be removed with sharp scaling instruments, just as in people. Products like these are false advertising. Veterinary dentist since 2009, here to teach you about making your dog and/or cat's teeth healthy! 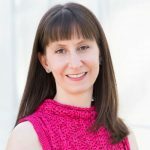 Dr. Buelow is a veterinary dentist and she is here to help you make good decisions about your furry family member's dental care. A healthy mouth is critical to overall health, so let's work together to improve the dental health of all dogs and cats!